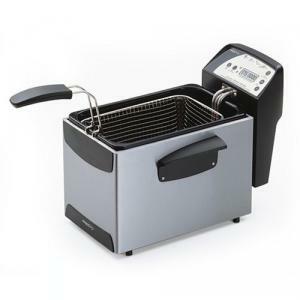 The Presto Profry Digital Professional Style Immersion Element Deep Fryer with oblong basket has a 9 cup food capacity is ideal for frying family sized batches. Digital control and display features an adjustable thermostat and countdown timer that times up to 30 minutes. The heating element and enameled pot are removable for easy cleaning. The cover has a filter that helps reduce spattering when lowering food into the hot oil.